The Childs Knight Shirt is great for finishing off your childs medieval outfit. The Childs Knight Shirt is available in multiple color combinations. This shirt has a button up front and a classic fold down collar. 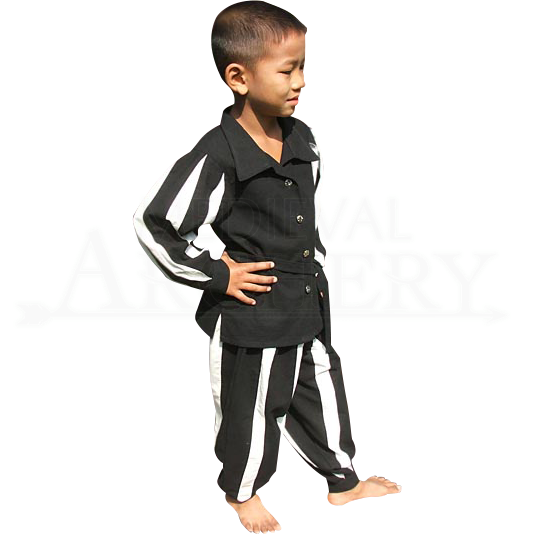 The full-length sleeves are decorated with colored slash stripes which run the length of the arm. The sleeves end in cuffs that feature fasteners on the inside of the wrist. The knight shirt is made of 100% cotton and is machine washable. The Childs Knight Shirt comes in sizes small, medium, large and x-large. The Childs Knight Shirt is the perfect shirt for your little one to wear to medieval events and renaissance fairs. When ordering, the first Color dropdown menu is for the main color of the shirt. The Accent Color is for the colored slashed stripes.